Want a link to your site, submit it on our contact us page. The WCC Website has all the information you need to know about the World Crokinole Championships and crokinole in the media. Here is a link to the most complete and up to date crokinole action. Nathan Walsh is the man to keep you on the edge of your seat when it comes to news, stats, facts and predictions. For crokinole fans this it THE blog. Check out the National Crokinole Association website for tournament listings, the latest points standings, club details and more. The London Crokinole Club has recently launched a new website and they want you to check it out. They will be hosting their fourth Crokinole Tournament in March of 2012. 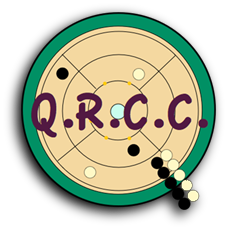 This link leads you to the Qunite Region Crokinole Club. They are hosting their first NCA Sanctioned Crokinole Tournament this fall. All the details are on their website. Are you looking for a high end, high quality crokinole board? Visit our friends site here for products from New Mexico. Check out one of the newest crokinole clubs to join the scene. Their slogan is "Friendly Finger Flickin' Fun!" and if you are interested you should contact them today! All your favourite Old Wooden Games! Rummoli, Cribbage, Bluff Poker, Hockeynole and more!! Tell them we sent you!